The latest episode of the Bo Xilai and Gu Kailai drama has left a nation waiting on the edge of its seat. 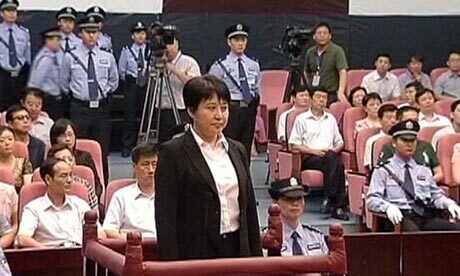 Last Thursday in a nondescript courthouse away from the power base of the fallen Communist Party leader Bo Xilai, his wife pleaded guilty to murder. She poisoned Neil Heywood. Her trial lasted one day. Over the weekend Xinhua News Agency has provided ample evidence. In-depth stories provided the details of the murder and its motivation. Gu was being blackmailed by Heywood. He threatened her son. Heywood wanted money for a botched real estate investment made with the son. Heywood knew of overseas funds transfers. He would get paid or expose the child of Gu Kaila and Bo Xilai to authorities. After Neil Heywood vomited from too much alcohol, Gu mixed poison into water then poured it into his moth. His death was ruled an accident from alcohol poisoning by corrupt policemen, who now await trial. Heywood’s family was pressured into a fast cremation without an autopsy. “I will accept and calmly face any sentence and I also expect a fair and just court decision,” Gu Kailai was reported by Xinhua to have said at trial. The one day trial and selfless confession have many Sinophiles suggesting the event was pre-scripted and well negotiated. Gu agrees to a speedy trial and avoids the death sentence, as she was protecting her child. Gu will accept the blame and make it less likely her husband will face serious charges. The parents will suffer to free their child. In all, most expect Gu Kailai to spend at least a decade in jail before a pardon when her case is almost forgotten. More await the next step in the saga of Bo Xilai. He was a rising power-broker in the Communist Party who was ideologically out of step with the ruling elite. Instead of reforms, Bo favoured a return to Maoism. He was known for singing robust renditions of old Communist classics. He enacted social policies to look after the poor and disenfranchised. He believed Communism meant looking after the collective good of the people. He was popular with the Army. All of this made him a powder keg when his senior-most police chief tried unsuccessfully to defect to the USA Consulate. He was said to be scared of Bo when the murder was uncovered. In alarming speed news of the cover-up circulated globally, Bo was stripped of his power and his wife was arrested. Today there are no charges leveled against Bo Xilai. His wife, on the other hand, sits in prison awaiting sentencing. Their son Bo Guagua is still in America and is completely inaccessible. Whatever does occur will happen soon. China is preparing for a change of leadership and the disquiet of Bo and Gu are spoiling their party. Before the Standing Committee of the Communist Party of China convenes this autumn, both Bo Xilai and Gu Kailai will have been dealt with and removed from the headlines. For Gu, China is waiting to see if she is removed from more than just the headlines. While most assume her confession buys her her life, it is still possible she could face execution. Like Gu Kailai, the entire nation is waiting.